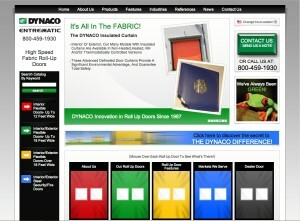 DYNACO doors are the safest and most energy efficient, complete door systems for both indoor and outdoor installation. What’s great about DYNACO doors? The Only True Soft, Fully Flexible, Forgiving Curtain In the Industry. Absolutely No Bottom Bars, Stiffeners Or Other Dangerous Components. Patented Side Guide Technology For An “Air-Tight” Seal. Crash Forgiving Door, With A Unique, Instant Re-Insertion Design. Maximum Productivity, And Maximum Environmental Control. Whether interior or exterior, if you need security, speed and aesthetic appeal, this is the door for you. The DYNARIGID is perfect for auto dealerships, parking garages or convention centers. Available in high strength aluminum, partial or full, equally strong clear windows and/or perforated slats for multiple vision options and circulation/ventilation. DYNARIGID doors have a unique auto-reversing, in-line, light curtain built into the side frames for ultimate safety.